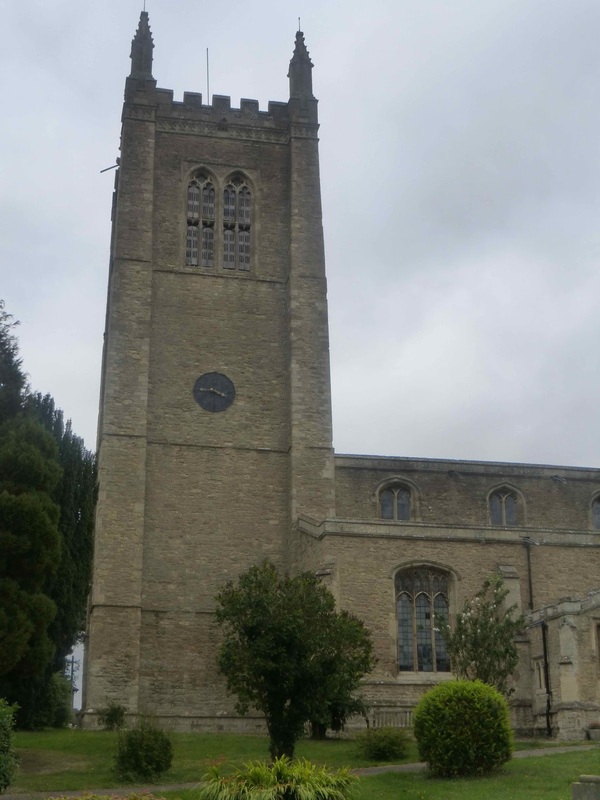 Odell church, Beds, is an imposing Perpendicular structure, dating almost entirely from the 15th century. The tower is particularly impressive; but I'm going to focus on a few of the objects contained within the church. Two windows, in the south aisle and chancel, have original stained glass surviving in the tracery lights; the iconoclasts didn't consider them idolatrous, or they were too lazy or incompetent to be bothered to climb up to the higher windows to smash them. 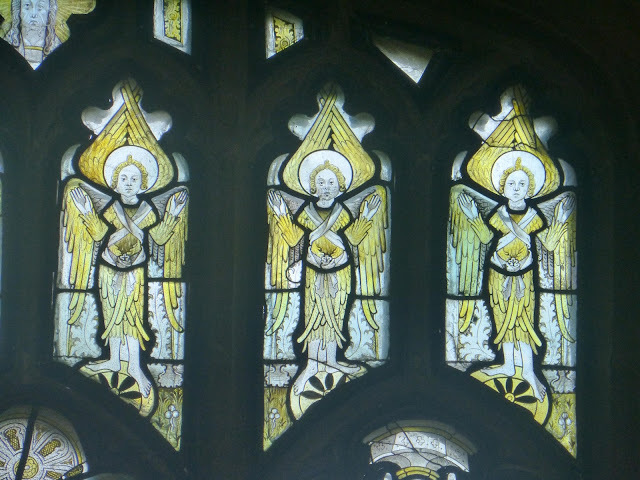 There are four complete and one fragmentary figures of angels; they stand on wheels, which identify them as Ophanims* (also known as Thrones). The yellow, very typical of windows from the 14th century on, is achieved by applying silver sulphide to the white glass before firing. 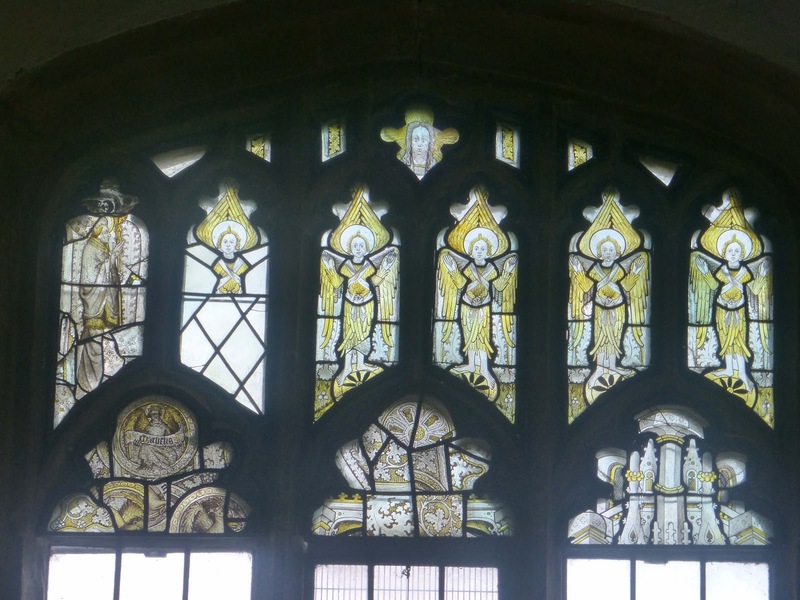 There's also a small head of Christ in the top central light, and a bishop in the left (no doubt not in situ), and other fragments in the tops of the main lights. 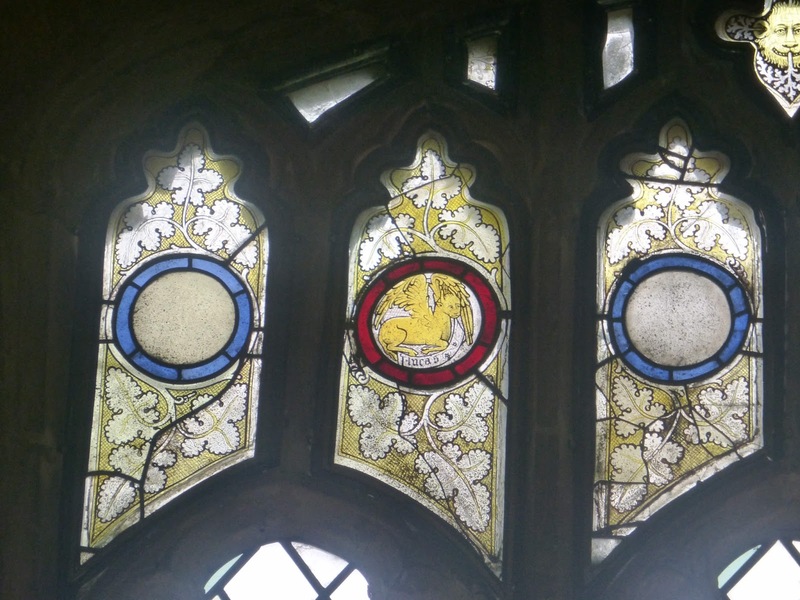 In the second tracery light in this window is the ox of St Luke, in the fourth the eagle of St John, then the human of St Matthew, and finally the sacred monogram IHC (the first letters of 'Jesus' in Greek). 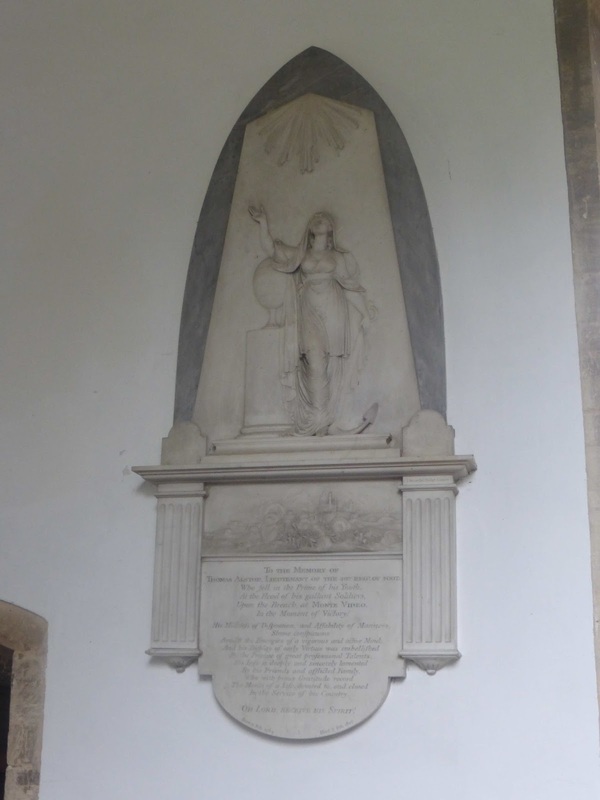 In the chancel is this fine if over-busy late 17th century baroque monument to the Alston family, probably of 1678. It's been attributed to Abraham Storey (who died c.1696). The Alstons first arrived in Odell in 1633, and they seem to have run the place for the next couple of hundred years. 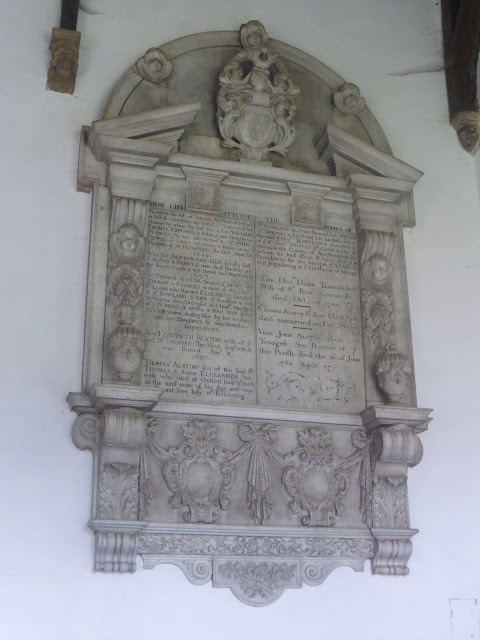 A Thomas Alston was made a baronet in 1642. Another Thomas, another baronet, became the MP for Bedfordshire in 1747; his wife ran off with a horse dealer from Stafford in 1752. He was, poor chap, for some time confined to a madhouse, excessive drinking perhaps being the cause. Nevertheless he was re-elected unopposed in 1754. (Insert you own joke about the mental capacities of current MPs here.) He died in 1774 and scandalously willed his property to his 'housekeeper', Margaret Lee, who eventually passed it on to their natural (i.e. illegitimate) son, who was, just to keep things simple, also called Thomas. 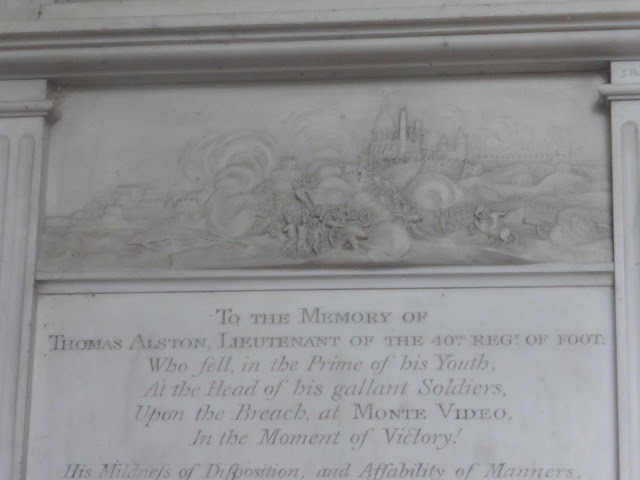 Facing the Alston monument across the chancel is this monument to yet another Thomas Alston (I think the grandson of the disreputable Thomas) who must have helped restore the family's good name by getting himself killed, a few weeks short of his 23rd birthday, at the Battle of Montevideo in 1807. It is by John Bacon the Younger (1777-1859), a very prolific sculptor. 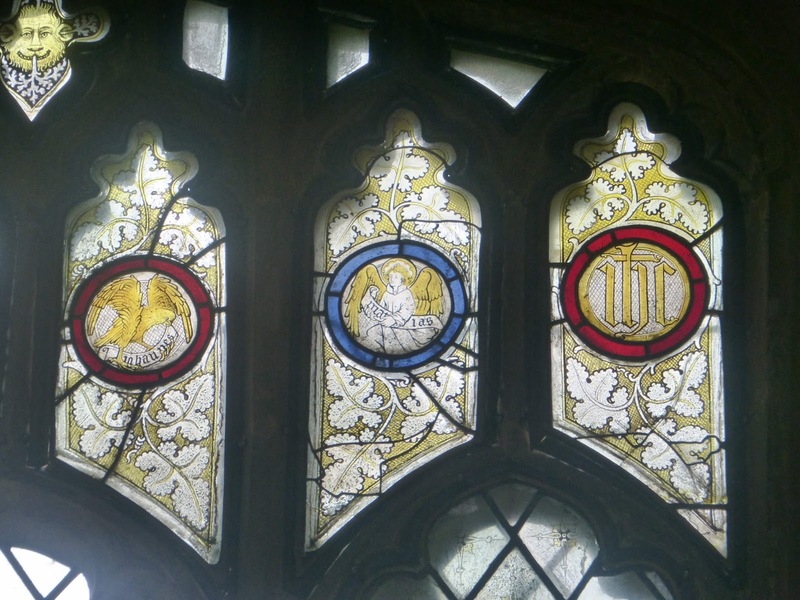 In about three decades (1793-1825) he produced a couple of hundred church monuments, and then seems to have more or less retired for the last three decades of his life. Most interesting of all is the relief panel showing the battle, with cannons and billowing gun smoke galore. If you're like me, you haven't heard of the Battle of Montevideo before; it was a sort of sideshow in the Napoleonic Wars, in which the British and the Spanish (soon to be united against Napoleon, but in 1807 still enemies) fought over the lands around the River Plate in present day Uruguay, hoping to expand their trade empires. This particular battle was a victory for the British, but the campaign as a whole was unsuccessful (Montevideo was held for only seven months). The British commander, Lieutenant-General John Whitelocke, was court-martialled and dismissed from the army as a result. 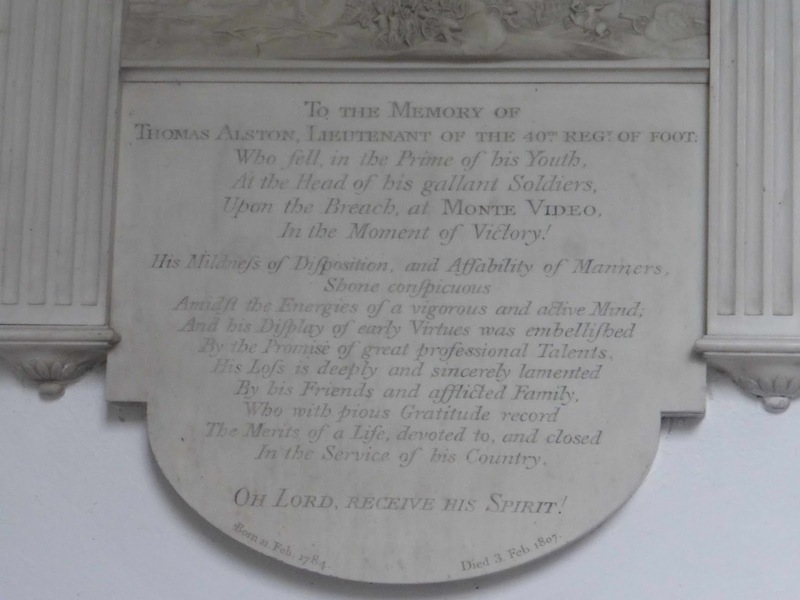 This didn't help young Thomas Alston, however, who, like so many men, young and old, of all nations, became a victim of clashing wannabe empires. I'm away for the next couple of weeks, so no posts for a while. * The Victoria County History identifies them as Seraphs.